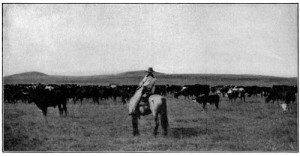 One illustration from “Sun and Saddle Leather,” a 1919 book of Clark’s cowboy poetry. On page 12 of Cowboy Up! Ride the Navajo Rodeo, I share a version of “A Cowboy’s Prayer” I heard shared during the Grand Entry of a Navajo rodeo.